Thomas Butts [1757-1845], 1803; Thomas Butts, Jr.; Captain F.J. Butts; his widow; sold 1906 through Carfax to W. Graham Robertson [1866-1948]; (his sale, Christie's, London, 22 July 1949, no. 43); (Thomas Agnew and Sons, London). Shaw Kennedy, by 1957. (Thomas Agnew and Sons, London), by 1963. Mr. James Biddle, New York [1929-2005] and Mrs. Louisa Copeland Biddle [later Mrs. Robert Duemling], New York, 1963; Louisa C. Duemling, Washington, DC; gift in 1991 to NGA. Carfax exhibition of works by William Blake, born 1757, died 1827 : 14 June to 31 July, 1906, no. 45. Nottingham Castle; Catalogue of a loan exhibition of works by William Blake (1757-1827), April, 1914, No. 39. The Manchester Whitworth Institute. Catalogue of a Loan Collection of Works by William Blake, February to March 1914. No. 39 (Exhibited under the title, "The House of Death, or the Lazar House"). Art for the Nation: Gifts in Honor of the 50th Anniversary of the National Gallery of Art, National Gallery of Art, Washington, p.124-125. Bosch e o Eterno Retorn [Bosch and the Eternal Return], Palácio Foz, Lisbon, Portugal, 1994 (catalogue by José-Augusto França, Bosch ou "Le Visionnaire Intergral"). Russell, Archibald G. The Letters of William Blake London: Metheun & Co., 1906: 117-124. Binyon, Laurence, The Drawings and Engravings of William Blake. London: The Studio, Limited, 1922: 21-22, No. 49. Figgis, Darrell, The Paintings of William Blake. London: Ernest Benn, Limited, 1925: 72-73, No. 53. Preston, Kerrison, The Blake Collection of W. Graham Robertson. London: Faber and Faber. LTD, 1952: no. 62, 158-159. Bentley, Jr, G. E., “Thomas Butts, White Collar Maecenas,” PMLA 71.5 (1956): 1052-1066. Keynes, Geoffrey The Letters of William Blake. London: Rupert Hart-Davis, 1956: 86-90. Keynes, Geoffrey William Blake’s Illustrations to the Bible: a catalogue. Boissia, Clairvaux, Jura, France: Trianon Press for the William Blake Trust, 1957: 172. Blunt, Anthony, The Art of William Blake. New York, Evanston, San Francisco, and London: Harper and Row, 1959: 108. Raine, Kathleen Blake and Tradition Vol. I. New Jersey: Princeton University Press, 1968: 413-412. Bentley, Jr, G. E. Blake Records. Oxford: Clarendon Press, 1969: 570-571. Gage, John, “Blake’s Newton,” Journal of the Warburg and Courtauld Institutes 34 (1971): 372-377, pg 375. Keynes, Geoffrey Blake Complete Writings. London: Oxford University Press, 1972: 823-826. Mellor, Anne Kostelanetz Blake’s Human Form Divine. Berkely and Los Angeles: University of California Press, 1974: 193-197. Bindman, David Blake as an Artist. Oxford: Phaidon, 1977: 132-139. Butlin, Martin. 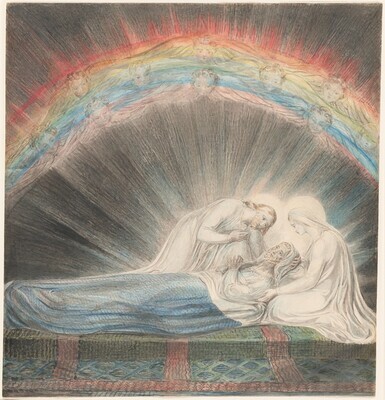 The Paintings and Drawings of William Blake . New Haven: Yale University Press, 1981: 365-366. Butlin, Martin William Blake 1757-1827. London: Tate Gallery Collections, 1990: 122. Johnson, Mary Lynn, “David’s Recognition of the Human Face of God in Blake’s Design for the book of Pslams,” in Blake and his Bibles edited by David V. Erdman, pgs. 117-156. Connecticut: Locust Hill Press, 1990: 119-120. Art for the Nation: Gifts in Honor of the 50th Anniversary of the National Gallery of Art . Exh. cat. National Gallery of Art, Washington, 1991: p.124. Kelly, Franklin. "William Blake, The Death of Saint Joseph." National Gallery of Art Bulletin no. 49 (Fall 2013): 22-23 (color).